The Madariyya are members of a Sufi order (tariqa) popular in North India, especially in Uttar Pradesh, the Mewat region, Bihar and Bengal, as well as in Nepal and Bangladesh. Known for its syncretic aspects, lack of emphasis on external religious practice and focus on internal dhikr, it was initiated by the Sufi saint 'Sayed Badiuddin Zinda Shah Madar' (d. 1434 CE), called "Qutb-ul-Madar", and is centered on his shrine (dargah) at Makanpur, Kanpur district, Uttar Pradesh. Originating from the Tayfuriya order, as his Pir, spiritual teacher was Bayazid Tayfur al-Bistami, Madariya reached its zenith in the late Mughal period between 15th to 17th century, and gave rise to new orders as Madar's disciples spread through the northern plains of India, into Bengal. As with most Sufi orders, its name Madariya has been created by adding a Nisba to the name of its founder Madar, leading to Madariya, sometimes spelled as Madariyya, though it is also referred as Tabaqatiya. The Dargah, or the tomb of Badiuddin Zinda Shah Madar, is located at Makanpur, near Kanpur city, in Uttar Pradesh state, India. 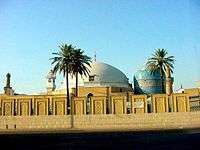 It is visited by thousands of visitors every month and especially during the annual Urs celebrations. ↑ Liebeskind, Claudia (1998). Piety on its knees: three Sufi traditions in South Asia in modern times. Oxford University Press. p. 49. ISBN 0-19-564309-7. ↑ Ghazzālī; George F. McLean (2001). Deliverance from error and mystical union with the Almighty- Volume 2 of Cultural heritage and contemporary change. CRVP. p. 60. ISBN 1-56518-081-X. ↑ Bakshi, S.R. (2003). Advanced history of medieval India. Anmol Publications PVT. LTD. p. 348. ISBN 81-7488-028-3. ↑ Harris, Ian (1992). Contemporary religions: a world guide- Longman current affairs. Longman. p. 216. ISBN 0-582-08695-7. ↑ Kanpur Dargahs in India.